Fulfillment in 3 provides effective tools to thrive in a 24-7 workweek. Fit, Fueled and Focused deliver sustainable and highly effective strategies to increase energy, speed weight loss, lower stress and stimulate brain waves responsible for productivity. F3 elevates three essential components responsible for performance; fitness, nutrition and mindset. The program sets you up for success by providing a comprehensive plan that is easily implemented without having to sacrifice valuable time or life’s enjoyment. High intensity interval training burns fat and build leans muscle in a short period of time. During a session, the EPOC (excess post oxygen consumption) is elevated, causing the body to burn calories up to 24 hours after the workout. Additionally, mitochondria is increased which creates a greater energy deficit in the muscles and the body uses fat cells for fuel. This causes the body to lose fat at such an elevated level when compared to endurance training. The limited rest periods between the intense work periods during the workout fatigue the muscles and cause them to adapt to the intensity of the exercise. These muscular adaptations will burn more fat and give the body a great toned shape. Do each exercise for 20 seconds as fast as possible. Rest 10 seconds, then repeat. The goal is to do the same amount of reps every round. Perform 8 rounds of each move. For additional HIIT workouts, check out our Fitness On Demand series! Yoga reduces inflammation and oxidative stress (which helps minimize signs of aging), boosts “feel-good” chemicals in the brain supports immunity, strengthens muscles, and increases energy levels. Yoga combined with deep breathing will help rejuvenate your mind and body, especially after long hours on a plane or in a car traveling to your destination. Hold each post for 1-minute. The plank is one of the best exercises for a flat, toned stomach because it works all the muscles in your core, including the rectus abdominus (the “six-pack muscles” you can see), transverse abdominus, internal and external obliques, hips, and back. Why not just focus on the six-pack muscles? Strengthening your entire core is not only crucial for sculpting a flat stomach, but these muscles also provide support for the entire body in everyday movements, reduce back pain, and improve posture. 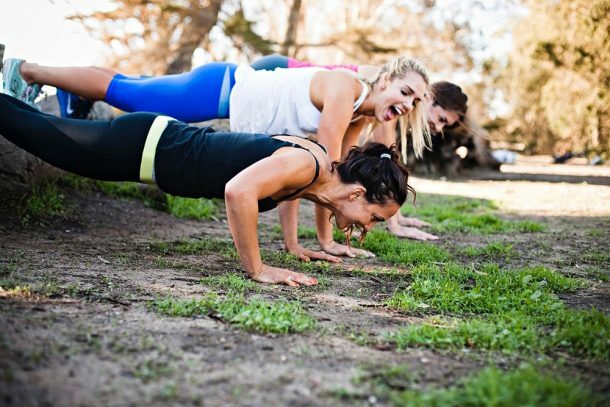 Plus, planks burn more calories than sit-ups or crunches because they recruit muscles in the legs, arms, and rear too. It’s truly the ultimate total-body toner! Start to get into a pushup position, but bend your elbows and rest your weight on your forearms instead of your hands. Your body should form a straight line from your shoulders to your ankles. Brace your core and draw shoulder blades toward one another. Hold this position for 30 second while breathing deeply. Work your way up to a minute. Rest for 15 seconds and repeat two more times. For additional workouts, check out our Target Zones videos that focus on specific toning exercises for the abs, arms and glutes! Shorten the time in which you eat to an 8-hour period. Time frame can vary (11-7, 12-8). During the 16 hours you are not eating, the body and brain reboot- turning on fat burning power, speeding inflammation, increasing cell turnover and reducing brain plaque. Reduce inflammation- repairs muscle, increases body’s ability to flush out toxins, lowers risk of disease. Reduces brain plaque- high inflammation from stress, sugar and lack of sleep creates brain fog, reduces focus and clarity. iPhone batter analogy- max power we can do everything (Facetime, watch movies, etc.). When we are running on low power, we have to conserve and cannot perform all the functions we want on our phones. Similar- when we start eating early in the morning and eat throughout the day until dinner- we conserve our energy for digestion as opposed to using our energy for max productivity like fat burning and brain power. How we set up our body first thing in the morning is how it will run well or poorly the rest of the day. We are used to eating a well balanced breakfast which typically includes protein, carbs and healthy fat. The problem with this method- once you introduce protein and carbs, the body starts to burn its glucose stores (sugar) instead of keytones stores (fat). In order to burn fat efficiently throughout the day and maintain high energy levels, we can either fast in the morning (as we discussed in last section) or enjoy a maca coconut coffee as you are all doing now. The healthy fats from coconut oil train the body to burn its own fat stores, balances glucose, curbs appetite and increases FIAF. What is FIAF? Our liver produces a hormone called fasting induced adiopose factor (FIAF). One of the functions of FIAF is to speed the body’s natural fat burning power by blocking lipoprotein lipase (LPL). LPL is the hormone that tells your body to store abdominal fat. By feeding the body healthy fats like coconut oil or grass fed butter in a fasted state, the liver produces more FIAF. The more FIAF we have in our system, the fast we will burn fat efficiently. Maca is a root vegetable native to the Andes. Natural healing superfood that comes in powder form at any Whole Foods or natural foods store. It’s also considered a powerful adaptogen- a name given to certain herbs, plants and natural substances that help the body naturally adapt to stressors like a busy schedule, demanding job or illness. During a workout, your body accesses glycogen stores to meet the demands of exercise. A post workout shake or meal will replenish these stores, rebuild muscle to come back even stronger and keep metabolism high. Try: 1 scoop vanilla protein powder,1/2 cup blueberries, 1 frozen banana, 2 tablespoon flax meal and 2 cups almond milk. Additional smoothie recipes to speed weight loss, boost beauty and enhance energy. Made with star ingredients that rev metabolism, deliver powerful antioxidants and increase calorie burning efficiency. Optional- add a scoop of plant based protein. Why: Dark chocolate is loaded with antioxidants, which fend off free radicals that are incredibly damaging to your system. Reducing free radicals in the body can improve your skin by increasing blood flow and improving hydration. Cocoa also helps to reduce stress, which results in less collagen breakdown. Why: Avocadoes provide all 18 essential amino acids necessary for the body to form a complete protein, which is ideal for building muscle and burning fat. This plant protein is easy to digest and readily absorbed by the body. One avocado provides vitamins A, C, E, K, B6 and a significant amount of potassium. Avocados help regulate blood sugar and reduce signs of aging. The healthy fat (oleic acid) helps keep you satisfied, which limits overeating. Why: Green tea contains less caffeine than does coffee, and provides L-theanine, an amino acid shown to promote a state of calm awareness. Green tea also helps to prevent the rapid rises and subsequent crashes in blood sugar levels that lead to fatigue and food cravings. 3-Minute Meditation to Reduce Stress to lower cortisol (stress hormone), boost serotonin and refocus the mind. By reducing cortisol the body will reduce stress, as well as avoid holding onto fat in the abdominal region. This ancient practice has major benefits, such as reducing cortisol levels. Even if it’s just a few minutes of deep breathing, you will begin to change your overall state of mind and significantly reduce stress. The practice of becoming present and deepening your breath calms the mind while reducing inflammation in the body. Start with five minutes a day and work your way up. Take it day by day, and before you know it, you will have a new incredibly-beneficial habit that will permeate through all aspects of your life. Lay or sit in a comfortable position. Turn on soothing music that does not have lyrics. Close your eyes and begin to take deep breaths through your nose and out your nose. Feel all the tension and thoughts melt away. Begin to count during each breath. Inhale for a five-count. Hold your breath for a five-count. Then exhale for a five-count. As you breath in say the word “relaxed” and as you breath out say the word “power.” This reinforces the idea that you are powerful beyond measure, yet graceful and calm in your approach. Continue that breathing pattern for three minutes. Using the thumb and index fingers of the right hand, make a "U" of the two fingers, using the thumb to close off the right nostril and the index finger to close off the left nostril. To end- inhale deeply, hold the breath a few seconds, lower the hand, and exhale. It may seem hard to believe that keeping a daily journal can actually transform your productivity, but studies show the activity not only improves results but increases leadership qualities. According to the Harvard Business Review, taking time to reflect and access your unique perspective will serve you in any leadership role. In addition, journaling can help improve gratitude, empathy and overall happiness. A 2014 study published in the Journal of Applied Sport Psychology found that gratitude increased athlete’s self-esteem, which is an essential component to optimal performance. According to the American Psychology Association, gratitude journaling can bring about “better sleep, less fatigue, lower levels of inflammatory biomarkers related to cardiac health” as well as reduced physical symptoms of illness. The list of benefits from daily journaling goes on, but productivity boost alone is enough to get started. Try the 3-minute journal each day. What are the 3 steps you can take today to accomplish these intentions? How will accomplishing these intentions be transformative in your life?